The Rideau Canal between the Ottawa River and Lake Ontario is now used only by pleasure boats. The lift from the Ottawa River to the canal is through a series of picturesque locks between the Parliament Buildings and the Château Laurier Hotel. The first stone of one of the locks was laid by Sir John Franklin, the famous explorer. 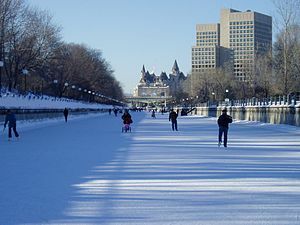 The project that eventually led to the building of the Rideau Canal began on September 29, 1783, immediately after the end of the American Revolutionary War. British military leaders wanted a route from the St. Lawrence to Lake Ontario that would not be exposed to the American border. Lieutenants Jones and French were assigned to survey what was ten wild territory and reported that a canal was possible by using the Rideau River and a chain of lakes. Nothing was done until after the War of 1812, when the building of the canal again became an issue. In 1824, Upper Canada became impatient with the delay and had another survey made by Samuel Clewes. The British Government offered to lend upper Canada £70,000 to build the canal, but Upper Canada would not go through with it. In 1826, the British Government sent Colonel John By to build the canal. he built the eight locks up the steep cliff from the Ottawa River and reserved the land on either side for military purposes. By coincidence, the opening ceremonies for the building of the canal in 1827 were on the same date that Jones and French began their survey, September 29. People came from near and far, on foot, in canoes and by ox-teams. It was an Indian summer: the forests were rich in colour, with scarlet maples and golden birches. During the opening ceremony, where Governor Dalhousie turned the first sod, frogs in nearby marshes provided their “musical” accompaniment. The first steamer, Rideau, made the journey from Kingston to Bytown in 1832. The route was busy until nearly 1900 when railways made it unnecessary. However, it becomes the “World’s Longest Skating Rink” in the winter! The Rideau Canal is amazing, as is its beginning. To learn more about it, I suggest going to the Rideau Canal World Heritage site, the Bytown Museum, the Canadian Encyclopedia, the Parks Canada. If you would like to take a holiday in Ottawa, then I would suggest clicking your way to Ottawa Tourism! Warning: today’s post is graphic and is not for kids or if your stomach is just weak today! Some stories of Indian massacres have been related, but the worst one of all happened at Lachine, a suburb of Montreal, on August 5, 1689. There are two sides to every story, and sometimes more. It was the Iroquois who had been provocation two years before. Governor Denonville had been asked by Louis XIV to capture some Iroquois and send them to France as gallery slaves. The Récollet priests had a mission for the Iroquois at the Bay of Quinte, west of Fort Frontenac on Lake Ontario. The Iroquois at the mission were invited to visit Fort Frontenac with their wives and children, but when they arrived they were seized by Denonville’s Intendant, horrified to see fifty members of his mission tied to posts, but could do nothing about it. They were flogged, and insects were put on their skins, while Hurons forced their fingers into hot pipes of tobacco. They were then sent to be galley slaves in France, where most of them died. On the night of August 4, 1689, a violent summer hailstorm swept across Lake St. Louis. As the householders got up to make sure windows were closed, they heard the screeching war cry of the Iroquois rising over the noise of thunder and hail. Within minutes, swarms of naked Iroquois, armed to the teeth, came running down the lane, their faces smeared with war-paint. There were 1,500 of them, taking advantage of the storm to cross the lake unseen. It is said that those who died in the first few minutes of the onslaught were fortunate. Men and women were cut down by tomahawks, and the brains of little children were dashed out against door frames and bedposts. One hundred prisoners were taken to the Iroquois villages in the Finger Lakes area, tied to stakes and burned or tortured. The prisoners might have been saved if soldiers 3 miles away had been allowed to take action. Unfortunately, their commanding officer, Subercase, was in Montreal attending a reception for Denonville. Returning to the camp, Subercase cursed his men for not having gone to Lachine without him. When they arrived the horror of the scene was beyond description, but the surgeon, who had managed to hide, told Subercase that the Indians to hide, told Subercase that the Indians had taken a large quantity of brandy. 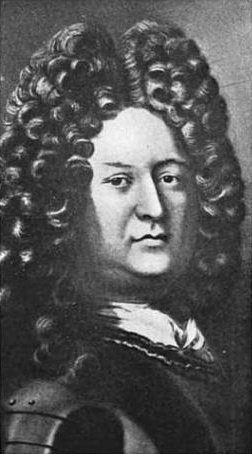 Subercase knew this was the time to attack, but just as he was about to follow the Iroquois, word came from Governor Denonville that he must hold his troops to guard Montreal. The Indians stayed on the rampage, capturing new communities and taking more prisoners, none of whom could be rescued by the French. To learn more about the Lachine Massacre, you can go to CBC Learning, and Rideau Canal and All That, and then Faith in Action. Lastly, I suggest Wikipedia.